By 2050, 66 percent of the world’s population is projected to live in urban areas. Growing cities strain food, water and energy systems, which in turn has a negative impact on economic, social and environmental sustainability and wellbeing. To address these challenges, regional governments, companies and universities are coming together to develop the technology and proposed system changes needed for “smarter” cities. An initiative in Spokane called Urbanova is one of the innovators in this movement, and Washington State University is a founding partner. Urbanova is a living laboratory in Spokane’s University District founded by Avista, the City of Spokane, Itron, McKinstry, the University District Development Association, and WSU. The focus of the lab is to harness data to gain insights, empower people and solve urban challenges in new ways. WSU’s research expertise in smart power grids and the food-water-energy nexus make it a natural innovation partner in this group. WSU researcher Von Walden is involved in Smart and Connected Streetlights, Urbanova’s pilot project, which is installing sensors and collecting data to improve understanding of pollution and health in the community. Walden, a professor in the Department of Civil and Environmental Engineering, is leading the air quality aspects of the project along with other researchers in the Laboratory for Atmospheric Research. 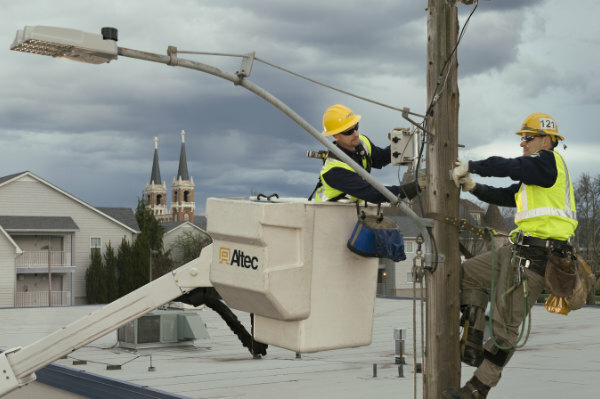 Working with Avista and Itron, the WSU team installed three air quality sensors on streetlights in the district. The data will provide insights into energy savings and efficiency and will be used with advanced weather and air quality models to improve understanding of micro-climates in urban areas. It will also provide unique and valuable information about how forest fires – which are common in the region – affect air quality and pollution in urban environments. The project is important because Spokane is one of hundreds of similar mid-sized cities in the U.S. that have rarely been studied for air pollution, Walden said. The researchers will install several more sensors later this year, and researchers from the WSU School of Electrical Engineering and Computer Science are developing a software platform to integrate, store, and analyze the air quality data as well as data from the power grid. They will also be making the real-time data on pollution levels publicly available.